The innovation of blockchain platform over the years has brought about lots of investment crypto opportunities platform. These has led to different processes of channelling investment via cryptocurrency investment platforms. The vast opportunities added via blockchain technology has made has made crypto currency best means of carrying out transactions. Different blockchain platform now come up with initial coin offering for investors to come invest in their platform coupled with benefits they enjoy after investment. The investments can be later traded or converted to fiat currency or left as crypto currency for domestic reasons. The process of going about achieving the aim which is gain has been a challenge because investment involves making the right decisions at the right time which most investor’s judge on individuals instinct which is very risky and can lead to loss of capital. This coupled with trading process because it involves constant motoring after the investment has been made is also to be considered. Also considering secure exchange platforms and wallets because of the variety available is another factor to consider for cryptocurrency security reasons. And finally, how to go about spending because cryptocurrncy is not globally acceptable making it really difficult converting to fiat currencies for domestic purposes. 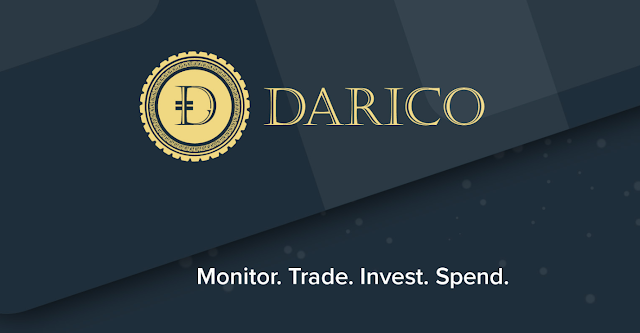 All these problems mentioned above has led to the innovation of the DARICO platform, a platform designed mainly for individuals to be able to monitor, trade, invest and spend their various types of cryptocurrencies fast, effectively and with ease. The platforms offer solutions to crypto currencies investors by providing them access to reliable information sources and tools to make informed investment decisions. The platform offers a GNIUS a DIRO wallet with lots of functionality can hold different types of cryptocurrency with great secure means to keep tokens safe via a cold storage. The wallet also comes with where exchange can occur which involves conversion of cryptocurrencies to fiat currency and vice versal process and portfolio management system that gives full details of cyptocurrency in GNIUS where information about the cryptocurrencies can be view graphically to determine value of cryptocurency in GNIUS. NYUS termed as the heartbeat of the system installed on the platform will give latest updates on how to go about making investments, analyse tokens via third parties, ICO new will give investors on this platform way edge ahead all access at a cost via the DARICO token. Index fund accessed via the DARCIO terminal will enable investors to determine worth and values of cryptocurrencies in their wallets. The innovation of the DARICO DEBIT CARDS will enable the easy use of using cryptocurrencies for domestic functions and easy conversion for fiat currencies and vice versal. Also, the DARIOC exchange DarEX will enable individuals and investors to trade easily, deposit and withdrawal different types of cryptocurrencies eliminating volatility problems in course of exchange which can lead to drop in value of the cryptocurrenncy. Adding Gibraltar a means of cryptocurrnecy exchange regulation will enable safe means of exchange transaction for investing individuals on the platform. All this will be access via a platform that is user friendly interface that requires no technicality both access on web and mobile. The DARICO platform will generate it revenue form charges gotten form transaction carried out on the platform. Darico aims to use up to 50% of the proceeds obtained from the sale of Darico Ecosystem Coins during the Public Sale Period to purchase Gold, BTC and ETH in the following proportions: 35% gold, 55% BTC and 10% ETH. These assets will be kept in reserve to ensure DARICO token stability (the “Liquidity Pool”). DEC is an ERC-20 utility token that holders can use to access the products and services available within the DARICO Ecosystem. Once the DARICO Blockchain is released, DEC will be transformed from ERC-20 to the native coin of the DARICO Blockchain. All DEC (ERC20) holders will receive the new DEC (Native Token) once they register their ETH Address on the website. The total DEC circulation will be limited to 120,000,000 DEC with 60% (72,000,000 DEC), being made available during the Public Sale Period.